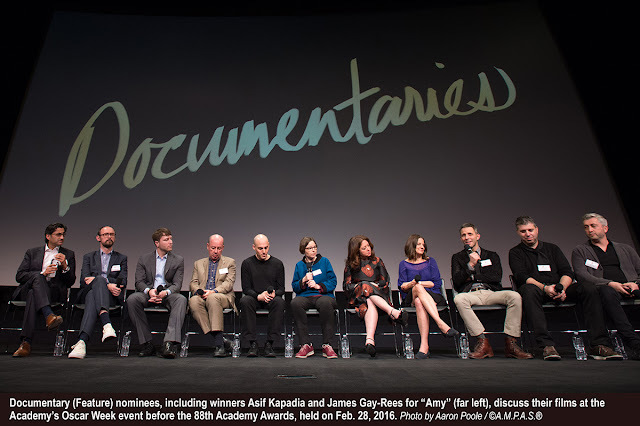 The Academy announced Oct. 28 that 145 features have been submitted for consideration in the Documentary Feature category for the 89th Academy Awards. The race for the Documentary Feature Oscar is on! This is up from last year's 124 films submitted and 134 films in 2014, and similar 147 films submitted in 2013. See the 15 films that made the cut for the shortlist. A number of the submitted will still need to have their required Los Angeles and New York qualifying releases, according the Academy news release. "Submitted features must fulfill the theatrical release requirements and comply with all of the category’s other qualifying rules in order to advance in the voting process." Watch for a shortlist of 15 films to be announced in early December. Per Academy Awards rules, films submitted in this category may also qualify in other categories, including Best Picture, as long as they meet the individual category requirements. We are less than 125 days away from the 89th Academy Awards nominations announcement on Tuesday, Jan. 24, 2017.